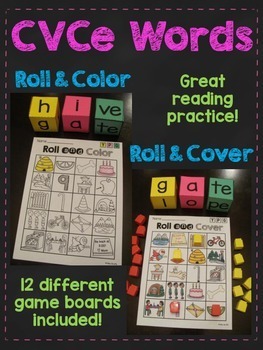 CVCe Words Roll Literacy Stations your students will LOVE that provides a lot of CVCe word reading practice! These games are played just like the CVC Words Roll! Save A TON by getting this in the Phonics Word Rolls MEGA Growing Bundle! Students roll the dice to make a CVCe word. They roll the 3 dice and keep the dice in the right color order (yellow, pink, green in the example pictures above) which they'll easily remember after a few rolls to build CVCe words. 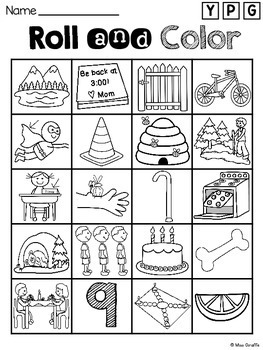 There is the first letter of the color order in the top right corner of their paper to remind them as well - and you can have them color those in before they start too for even more support. A student directions sheet is also included you can lay out. I have included 2 sets of dice and game boards so there is even more practice in this pack! A lot of CVCe words are possible so they'll get A LOT of reading practice!! After they roll the dice, they read the word they made. If it is a real word and on their sheet, they COLOR it in. 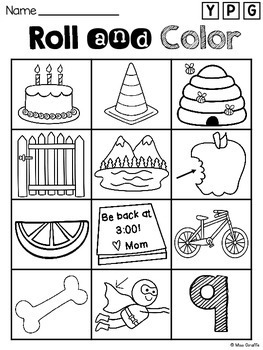 You can give students their own sheet to color in or have students share a sheet and each use a certain color (for example, Student A colors in pictures red and Student B colors in pictures blue) and the first to get a line wins! I recommend giving them their own sheet because there may be so much blocking that no one wins. You can also play where they fill the sheet and whoever has the most wins. There is also a Roll and COVER version of each gameboard in full color so students can use these again and again. Students will need their own color marker/piece (I recommend counting cubes or red/yellow counters) so when they roll a word, they cover it. It's up to you if you want to allow bumping or not! Bumping is when a child gets a spot that is already covered and can bump the other person off. There are 3 game boards for the on-level activity [20 pictures per board] included (each coming in both full color and black/white) and 4 below level game boards [12 pictures per board] included for the first set of dice. The second set of dice has 5 of the easier level activitiy game boards. That is 12 game boards total included in this pack. Each of the 12 game boards come in both color (Roll & Cover) and black/white (Roll & Color). UK spelling versions (colour for color) are also included in the file. CVC Words Roll (mix) **best seller! This is also included in the Long Vowels ULTIMATE BUNDLE if you want a ton of fun long vowels resources in a big bundle!